Go on a Nagomi Visit! Looking for a special tour during your stay in Tokyo? Club Tourism takes visitors beyond the typical tourist route with their various tours. Time Out Tokyo was kind enough to feature Nagomi Visit. 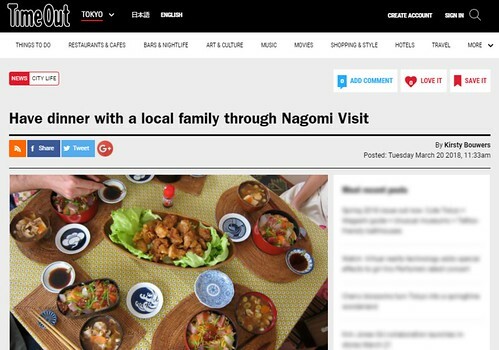 What was most exciting about the article was that it explained our name Nagomi Visit. It had been awhile since an article covered the meaning behind our name. The article provided an opportunity to reflect on our name which holds a lot of meaning about our mission as an organization. "The name shows this too: 'Nagomi' is an alternative reading of the kanji 和, which refers to all things Japanese, yet can also mean 'bring together'. Make a verb (nagomu or nagomi) out of it, and it refers to the feelings you have when spending time with good friends – precisely the feeling which Nagomi Visit hopes to evoke." We also appreciate them taking the time to highlight the fact that we are a nonprofit and our reasons for choosing to be one.